There are numerous cases of seasonal influenza across America, on an annual basis. “According to the Canadian Medical Association Journal, the flu kills up to 2,500 Canadians and about 36,000 Americans annually. Worldwide, the number of deaths attributed to the flu each year is between 250,000 and 500,000″ (Thomas Walkom, The Toronto Star, May 1, 2009). 3) The WHO in its reporting only refers to “confirmed cases” (see relevant tables). It does not distinguish between confirmed and non-confirmed case. It would appear that the “non-confirmed” cases are categorized as confirmed cases and the numbers are numbers then used by the WHO to prove that the disease is spreading. The underlying political intent is to use the WHO level six pandemic to divert public attention from an impending and far-reaching social crisis, which is a largely the consequence of a deep-seated global economic depression. Lost in the midst of hundreds of pages, Public Law 109-364, better known as the “John Warner Defense Authorization Act of 2007″ (H.R.5122) includes a specific section on the role of the Military in civilian affairs. A nationwide flu vaccination program has been in the pipeline since 2005. Consistent with its role as “lead agency”, more than half of the money earmarked by the Bush administration for the program was handed over to the Pentagon. In other words, what we are dealing with is a process of militarization of the civilian public health budget. Social sector budgets are now being transferred to the Department of Defense. The money for a public health program is controlled by the Department of Defense, under the rules of DoD procurement. The threat of the H5N1 bird flu pandemic in 2005 resulted in multibillion dollar earnings for the pharmaceutical and biotech industry. In this regard, a number of major pharmaceutical companies including GlaxoSmithKline, Sanofi-Aventis, California based Chiron Corp, BioCryst Pharmaceuticals Inc, Novavax and Wave Biotech, Swiss pharmaceutical giant Roche Holding, had already positioned themselves. In 2005,.a Maryland-based biotechnology company MedImmune which produces “an inhaled flu vaccine” had positioned itself to develop a vaccine against the H5N1 avian flu. Although it had no expertise in the avian flu virus, one of the major actors in the vaccine business, on contract to the Pentagon, was Bioport, a company part owned by the Carlyle Group, closely linked to the Bush Cabinet with Bush Senior on its board of directors. If Martial Law or a National emergency were to be adopted in the context of a Public Health emergency, what we would be dealing with is the “forced vaccination” of millions of people as well as the establishment of internment facilities for people who have been quarantined. There has been virtually no press coverage of HR 645, which is currently being discussed by several congressional committees. (See US Northcom website at http://www.northcom.mil/index.cfm?fusea ... .who_civil ). It is worth noting that Northern Command (USNORTHCOM) has developed, over the past few years, a clearly defined mandate in the eventuality of a flu pandemic. It seems to me that in the last few years everyone in gov. simply jumps the gun. They did the same thing with the bird flu, and nothing happened. However on the other hand, there are many red flags. Flags like all the dead microbiologests, USSR's germ war facility meltdown. swine flu shots batches in record time of 3 months insted of the 18 required. etc. Only time will tell. About my visit to Baxter in Orth an der Donau – a bioweapons facility? Germany’s alternative media is increasingly reporting on Baxter, WHO and also on legislation allowing forced vaccination in Germany, such as paragraph §20 of the German Law on Infection Protection which cancels basic civic rights in the event of a pandemic “emergency”. This morning I recorded an interview with Michael Vogt. After that, I went to visit Baxter’s facilities on Orth an der Donau with Thomas Pfeiffer and Markus Wolf from Grenz tv to take a closer look at the place where 72 kilos of seasonal flu material was manufactured and contaminated with live bird flu virus (courtesy of WHO) this February before being sent out to 16 labs in four countries, nearly sparking a pandemic. If you check out Baxter’s facilities on the Uferstrasse in Orth an der Donau using Google satellite maps, you will get some idea of just how large the complex is — and also how isolated. Set apart from an idyllic but tiny village (a church, a castle and a few shops), the Baxter complex is in a thickly wooded area not far from the Danube river. It can be reached only by one road and that is a winding country lane – a lane so narrow, moreover, that cars can barely overtake. That said, the shade from the woods was very pleasant with temperatures soaring into the mid-thirties. An arrow straight cycling path runs along a raised bank on one side of the complex, which is screened by more impenetrable woods. But there is no other road or footpath close by. As we drove along the cycling path and got an idea of just how vast the woods around the complex are, the car’s satellite navigational system stopped working….Mind you, we shouldn’t have been driving on a cycling path anyway. Lots of cars with German number plates were parked in the parking lot where the flags of Baxter, the USA, EU and Austria flutter from flag poles. Baxter’s research and production facilities in Orth an der Donau are among the most up to date in the world, and the complex is truly gigantic with an extrension also in the process of being built. The granite and concrete buildings with narrow, dark, reflecting windows have a martial-look, though the tallest was only three-storeys high. A fence adds to the impression of secrecy. Cars going in and out have to pass through a barrier beside a security guardhouse. We weren’t allowed to film close to the entrance. As soon as we walked up, a security guard in a blue paramilitary style uniform with his trousers tucked into ankle boots on a bike — used for patrolling the cycling path at the side of the complex? — rushed up and approached us together with a Baxter employee who told us we were not allowed to film the outside of the facilities even though the parking lot is technically public ground. Anyway, the place sure looked like a high tech bioweapons development and production facility rather than like an ordinary biotech or pharma company to me – and it had the security to match. It was hard to imagine how lorries could navigate the narrow country road leading to Baxter – as they presumably must to bring supplies in to the production facility and also to transport the products back out. A woman serving drinks in an inn in the village of Orth an der Donau told us that a lot of the local people work for Baxter but no one seemed to know a great deal about the place. Thomas and Markus hope to have a short documentary ready by August 20th. Ten things you're not supposed to know about the swine flu vaccine !! 2. Swine flu vaccines contain dangerous adjuvants that cause an inflammatory response in the body. This is why they are suspected of causing autism and other neurological disorders. 3. The swine flu vaccine could actually increase your risk of death from swine flu by altering (or suppressing) your immune system response. There is zero evidence that even seasonal flu shots offer any meaningful protection for people who take the jabs. Vaccines are the snake oil of modern medicine. 5. Even if the swine flu vaccine kills you, the drug companies aren't responsible. The U.S. government has granted drug companies complete immunity against vaccine product liability. Thanks to that blanket immunity, drug companies have no incentive to make safe vaccines, because they only get paid based on quantity, not safety (zero liability). 6. No swine flu vaccine works as well as vitamin D to protect you from influenza. That's an inconvenient scientific fact that the U.S. government, the FDA and Big Pharma hope the people never realize. 8. Drug companies are making billions of dollars from the production of swine flu vaccines. That money comes out of your pocket -- even if you don't get the jab -- because it's all paid by the taxpayers. 9. When people start dying in larger numbers from the swine flu, rest assured that many of them will be the very people who got the swine flu vaccine. Doctors will explain this away with their typical Big Pharma logic: "The number saved is far greater than the number lost." Of course, the number "saved" is entirely fictional... imaginary... and exists only in their own warped heads. 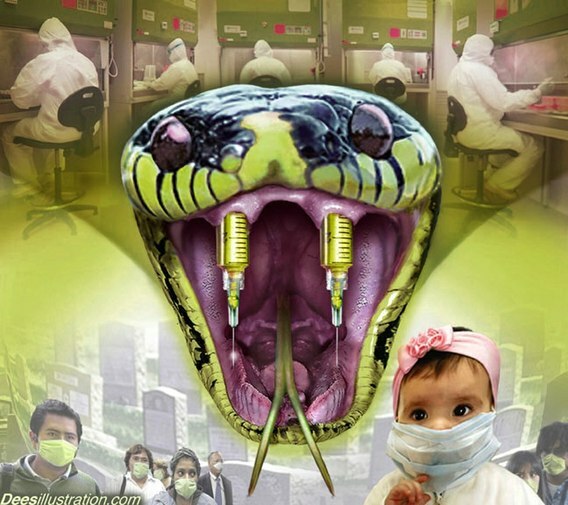 * US children to be used as Guinea Pigs to test swine flu vaccine while virus is man made !! * Drug Companies Responsible for Swine Flu or H1N1 Outbreak? Look for other nations to follow next!.. In larger Nations such as USA they won't I have a feeling way to expensive. But they will use fear to drive the heard into getting it. Then when half way threw the "pandemic" they will make it Mandatory so they can round up the stragglers. Greece will vaccinate its entire population of 12 million against the H1N1 swine flu pandemic which has swept around the world in weeks, killing hundreds of people, the country's health minister said on Friday. "We decided that the entire population, all citizens and residents, without any exception, will be vaccinated against the flu," Health Minister Dimitris Avramopoulos said after a ministerial meeting. "Greece will order 16 million more doses from the same companies in the future," a health ministry official who declined to be named told Reuters. "We are only waiting for the European Union's approval to start vaccinating everyone." Latest News for Sned, had this snip in it. vaccine has Class "A" 'Particles' (aggregates), once nicknamed "Ganesh Particles." to really prevent GC crossover? I've been thinking along those lines myself the past week. Why in the hell is WHO/CDC/Health agencies across the globe 'suddenly' out of no where concerned about their countries population ALL of them down to homeless MUST get the jab's for H1N1. As I write this the according to reports the USA alone has bought 318 dose of vaccinee... That's the entire US population give ro take 1%. What the hell suddenly Uncle Sam is so considerate about everyone?? This is unheard of! And where the hell did all this money pop up to do just that!! I thought for past two years the world ecomenic system was on the verge of Second Great Depression at least that's what they were screaming in Washington and the press. The same it appears as of this tate date is going on in other countries as well on top of this there are CLEAR signs and indications that come this fall the jabs will be Mandatory! Shady, see if these facts resonates with you. 3. 'd' drawing on white board of Vishnu Schist and Lotus. So can we concluded that that the Project Lotus, get it name based off the effect of Lotus and 'd' the guy that gave us gulf war syndrome is concocting a virus to shed class A "Ganesh" particles? Is the reason so the PTB that don't have the 'd' virus will have more class A "Ganesh" particles and become Supreme beings during the GC? 1. The US government is using laws designed for dealing with a very deadly pandemic or bioterrorism to bring in a mass vaccination program for swine flu, specifically the Public Readiness and Emergency Preparedness Act of 2006. 2. This law removes liability from the manufacturer, medical practitioners who use the product, and from “government program planners” who decided on using the law. A suit can only be brought if the DHHS Secretary allows it, and if there is willful misconduct on the part of the manufacturer. WHO says vaccine will be ready in September. Novartis began testing in humans in late July, and Sanofi-Aventis and Glaxo-Smith Kline are starting now. 5. The adjuvants likely to be used to strengthen vaccines and stretch the supply are named MF59 (Novartis) and ASO3 (Glaxo Smith-Kline). Only 3 vaccines using this type of adjuvant (oil-in-water, a.k.a. squalene-containing) have been licensed in Europe, and none have been given a license in the US. Two vaccines using these adjuvants are only used in people above the age of 65 (Fluad-MF59), and those with serious kidney disease (Fendrix-ASO4). Both advanced age and kidney failure weaken the immune system, so more powerful vaccines are needed, but in this population autoimmunity is unlikely to result from powerful immune stimulation. Cervarix is the third European vaccine (using adjuvant ASO4 against HPV) and its safety is controversial. According to the Congressional Research Service, on April 27, 2009, the Food and Drug Administration issued four Emergency Use Authorizations in response to requests from the CDC to make available certain drugs, diagnostic tests and respiratory protection devices. 7. Vaccines containing MF59 and ASO3 have not had Emergency Use Authorizations issued for them–yet. However, the government has purchased $698 million dollars’ worth of these adjuvants in recent weeks. See page 391 re MF59 carcinogenicity testing, according to a Novartis scientist. 9. The result of the new bioterrorism laws (passed with the expectation of use for much more dangerous epidemics than the current swine flu), which allow use of untested products AND give manufacturers an incentive to avoid comprehensive testing (to avoid being found guilty of willful misconduct) have combined with the political imperative to provide citizens vaccines in a hurry, yielding a Perfect Storm. In the 1976 swine flu vaccine program, 40 million people were vaccinated with an inadequately tested vaccine. The government gave the vaccine manufacturers immunity from liability, but created an alternative compensation program. Five thousand people sought benefits for vaccine injuries. Today, untested vaccines with novel adjuvants that are likely to cause more autoimmune illness than occurred in 1976 will almost certainly be used. The manufacturers have been given liability, as have the government program planners. But no compensation mechanism has been created. And the public has not been informed. NEW DELHI, Aug. 11 (Xinhua) -- India is virtually in the grip of A/H1N1 flu with the virus gradually spreading across the country and claiming its eighth victim Tuesday, a 13-year-old girl from the western city of Pune. More than 1,000 cases of the new flu strain have been reported across India. Pune, which accounts for five of the eight deaths nationwide, has recorded the highest number of cases, followed by the national capital where some 228 cases have been confirmed so far. It is also the worst affected place where a number of schools have been shut temporarily over fears of children contracting the disease. All these indicate that the country is in panic, despite government's repeated assurance that it has enough stocks of the anti-flu drug, Tamiflu, and adequate flu testing centers, say experts. "The flu has killed over 800 people across the globe. India is no exception. People are panicky of the flu outbreak hitting the country. More than the reported cases, people are now awfully fearful in the wake of the eight deaths," said Dr. Deepa Roy, a consultant physician based in Delhi. "Though the government is insisting that it has adequate testing centers, only some government laboratories are equipped to test the virus. The private medical centers are not authorized to conduct testing of the flu," Deepa Roy said. Last Monday showed the beginning of fatalities when a 14-year-old girl became the first person in the country who died of the new flu. Over the weekend, three more people died of the flu in western India -- a 43-year-old Non Resident Indian businessman in Gujarat state, a 42-year-old teacher in Pune city and a 53-year-old woman in Mumbai. On Tuesday, 13-year-old Shruti Gawade, a student of Ahilyabai School, became the latest victim. She had developed acute respiratory distress syndrome after having tested positive on Saturday. The Malaysian coach at the World Badminton Championship in the southern Indian city of Hyderabad is undergoing test after complaining of flu symptoms. "Panic is growing among the people with flu deaths, making it to the front pages of newspapers and main TV news. Several schools in the national capital have closed temporarily as fears grow about children contracting the flu," contended Delhi-based prominent child specialist Dr. Ravi Pramanik. "In Delhi, health officials are claiming that people are panicking because the symptoms of swine flu and common influenza are similar. But, people have no other option than to panic," said Ravi Pramanik. Indian Health Minister Ghulam Nabi Azad has also admitted that the flu is spreading. "The number of swine flu cases is rising. We have to work a little harder. All state governments have been asked to set up their own swine flu helplines, create more quarantine wards not only in their hospitals but also in the big private hospitals," he told the media in the national capital on Monday. He also urged people not to panic, but to look out for symptoms and get treated. "But, there are still concerns over the ability of the badly run and under-equipped government hospitals to handle the rising tide of patients. The 18 swine flu testing centers with 27,000 testing kits available in India are not sufficient with the number of swine flu cases rising in the country. There is a need for a public-private partnership between the hospitals to tackle the flu, this was also said by Minister Dinesh Trivedi," said Professor Ajay Singh, an expert in India. What's more shocking is that the increasing number of flu cases in India is making the Non-Resident Indians (NRI) wary of coming back to the country in this festival season. In fact, a number of Gujaratis living abroad have decided to cancel their India visit during the time of the Hindu festival because of fear of the flu. "There are about 1.5 million Gujaratis based in the United States and 700,000 in the United Kingdom. Most Gujarati families settled abroad make a trip to India to celebrate Navratri but this time around things are very different," NRI business Desai, who was on a brief tour to the country, told the media Monday while boarding a flight to the United States. "Many have issued advisories urging their relatives not to visit this season. And if a visit is unavoidable, they should get undergo medical examination before entering the state." Meanwhile, India has said that it will import the flu A/H1N1 vaccine from the company that develops it first. "Three Indian companies -- Serum Institute, Bharat Biotech and Panacea Biotech -- are working towards developing India's indigenous flu vaccine which will take around six months. Only one of them has started animal trials. However, should any country develop the vaccine, we will import it for our doctors, paramedics and health workers who are at highest risk of infection," the health minister said. HYPER URGENT ! SELON L’OMS, CEUX QUI REFUSENT LA VACCINATION SONT DES « CRIMINELS » ! + L’OMS A LE POUVOIR DE DISSOUDRE LES GOUVERNEMENTS SOUVERAINS ET PRENDRE LE CONTROLE EN CAS DE « PANDEMIE » ! LES CRIMINELS NAZIS DE L’OMS ET DES GOUVERNEMENTS, QUI TENTENT D’IMPOSER AUX POPULATIONS UN VACCIN MEURTRIER BOURRE DE POISONS, OSENT SE PERMETTRE A PRESENT DE CONSIDERER QUE TOUTE PERSONNE QUI REFUSERA LA VACCINATION SERA CONSIDEREE COMME « CRIMINELLE » ! Le comble de la perfidie, de l’hypocrisie et de l’inversion des valeurs ! 1) L’OMS (ORGANISATION MONDIALE DE LA SANTE) A LE POUVOIR DE DISSOUDRE LES GOUVERNEMENTS SOUVERAINS ET PRENDRE LE CONTROLE AU CAS OU IL Y AURAIT UNE « PANDEMIE » (on comprend mieux pourquoi l’OMS était si pressée d’élever le niveau d’alerte à son maximum ! ). Or, selon le niveau d’alerte maximal de l’OMS, NOUS SOMMES EN SITUATION DE “PANDEMIE” ! Cela signifie que, dans les faits, EN CE MOMENT MEME, les gouvernements ne sont déjà plus au contrôle, du moins en ce qui concerne la santé ! C’est une INSTANCE MONDIALE (L’OMS) qui dirige ! Cela ne constitue-t-il pas une occasion fort opportune pour les salauds au pouvoir de tester une forme de gouvernance mondiale ? 2) En cas de pandémie, les gouvernements nationaux seront donc dissous et remplacés par des COMITES DE CRISE SPECIAUX qui prennent en charge LES INFRASTRUCTURES DE “SANTE” ET DE “SECURITE” D’UN PAYS. CES COMITES DE CRISE SPECIAUX DEPENDENT DE L’UNION EUROPEENNE ET DE L’OMS, EN EUROPE (nous sommes donc bien au centre des préoccupations des mondialistes) et de l’OMS et des Nations Unies (ONU), en Amérique du Nord (comprenez Union nord-américaine : USA, Canada, Mexique) ! Nous voyons donc que les charognes de chefs d’Etat nationaux ont accepté, au fil du temps, de se soumettre à une autorité supranationale régionale (Union européenne, par exemple), et qu’ensuite, les chefs d’Etat crapuleux et l’autorité supranationale régionale ont accepté de se soumettre à des organismes mondiaux ! Dans les faits, nous pouvons donc constater que la base pour la constitution d’un gouvernement mondial existe déjà (ce qui ne veut absolument pas dire que nous devons accepter ce fait honteux sans réagir ). 3) L’article qui suit nous explique toutes les mesures qui peuvent être prises (aux USA) en cas de « pandémie » (et nous y sommes, puisque l’OMS, malgré l’absence de pandémie, a déclaré le niveau d’alerte maximum). Bien entendu, ces mesures pourraient être fort proches, en tout ou en partie, de celles qui seront prises dans nos pays d’Europe, puisque tout est chapeauté, en définitive, par l’OMS ! Parmi ces mesures, on trouve celle qui consiste à FORCER DES PERSONNES A ETRE VACCINEES, TRAITEES OU MISES EN QUARANTAINE POUR CAUSE DE MALADIE INFECTIEUSE (petit rappel : mettre en quarantaine peut aussi signifier, aux USA et ailleurs, la « mise en quarantaine » peut signifier, dans le concret, l’enfermement des gens dans des camps de concentration du style « camp d’internement pour civils » de la FEMA). D’autres mesures totalitaires incluent la PRISE DE SANCTIONS (amendes, par exemple) ou la SUPPRESSION DES DROITS DE PROPRIETE (l’Etat vous chasse de votre logis, confisque tous vos biens). Même L’UTILISATION DE LA FORCE BRUTALE AFIN DE TUER ceux qui refusent la vaccination serait autorisée ! Conclusion : NOUS LE VOYONS DONC CLAIREMENT : SI UNE OPPOSITION FAROUCHE NE SURGIT PAS POUR REFUSER EN BLOC LE VACCIN TOXIQUE « CONTRE » LE H1N1, IL Y AURA DES VICTIMES PAR MILLIERS DUES A LA VACCINATION, ET UNE DICTATURE MEURTRIERE ET SANS PITIE SE METTRA EN PLACE. NOUS N’AVONS DONC D’AUTRE CHOIX QUE DE RESISTER ET DE COMBATTRE CE PLAN MALEFIQUE ! On trouve aussi dans cet article que je vous ai traduit en français, toute une série de considérations très intéressantes concernant les mensonges du gouvernement des USA. “Aujourd’hui, l’Amérique serait scandalisée si les troupes de l’ONU entraient à Los Angeles pour rétablir l’ordre. Demain, elle vous en sera reconnaissante! Ceci est particulièrement vrai si on leur disait qu’il y avait une menace extérieure, qu’elle soit réelle ou propagée, qui menaçait notre existence même. C’est alors que tous les peuples du monde supplieraient qu’on les délivre de ce mal. La seule chose dont tout homme a peur est l’inconnu. Face à ce scénario, les droits individuels seraient volontairement abandonnés contre la garantie de leur bien-être qui leur sera accordée par le Gouvernement Mondial”. Henry Kissinger, Conférence Bilderberg, Evians, France, 1991. Je vous propose à présent de lire l’article ci-dessous. BONNE REVOLUTION… OU BONNE VACCINATION, BONNE DICTATURE, ET BONNE MORT ! Vic. L’ORGANISATION MONDIALE DE LA SANTE A DETERMINE, EN 2005, QU’ELLE A LE POUVOIR DE DISSOUDRE LES GOUVERNEMENTS SOUVERAINS ET PRENDRE LE CONTROLE AU CAS OU IL Y AURAIT UNE « PANDEMIE ». CECI S’APPLIQUE A TOUT PAYS INSCRIT A L’OMS… et bien sûr nous y sommes inscrits. L’OMS vient de soulever le niveau d’alarme de cette pandémie inexistante au niveau 4. Selon cette déclaration de l’OMS, en 2005 (extrait) : « SELON LES PROJETS SPECIAUX EN CAS DE PANDEMIE PROMULGUES DANS LE MONDE ENTIER, Y COMPRIS AUX ÉTATS-UNIS, EN 2005, LES GOUVERNEMENTS NATIONAUX DOIVENT ETRE DISSOUS DANS LE CAS D’UNE SITUATION D’URGENCE CAUSEE PAR UNE PANDEMIE, ET REMPLACES PAR DES COMITES DE CRISE SPECIAUX, QUI PRENNENT EN CHARGE LES INFRASTRUCTURES DE SANTE ET DE SECURITE D’UN PAYS, ET QUI RELEVENT DE L’OMS ET DE L’UNION EUROPEENNE EN EUROPE, ET DE L’OMS ET DES NATIONS UNIES EN AMERIQUE DU NORD ». - Force les individus soupçonnés de développer une “maladie infectieuse” à subir des examens médicaux. - Pister et partager les renseignements médicaux personnels d’une personne, y compris les informations génétiques. - FORCER DES PERSONNES A ETRE VACCINEES, TRAITEES OU MISES EN QUARANTAINE POUR CAUSE DE MALADIES INFECTIEUSES. - Rendre obligatoire le fait que tous les fournisseurs de soins de santé signalent tous les cas de personnes qui développent toute maladie ou trouble de santé qui pourrait être provoqué par une épidémie ou un agent infectieux et pourrait représenter un « risque important » pour un « nombre important de personnes, ou provoquer un handicap à long terme ». (Remarque: ni la notion de « risque important » ni la notion de “nombre important” ne sont définies dans le projet). - Forcer les pharmaciens à signaler tous les taux de prescription médicale accrus ou inhabituels et qui pourraient être causés par des maladies épidémiques. - ANTICIPER SUR LES LOIS, REGLES ET REGLEMENTS DEJA EXISTANTS DANS LES ETATS, Y COMPRIS CEUX QUI SONT RELATIFS A LA VIE PRIVEE, A L’OBTENTION D’UNE LICENCE MEDICALE, ET – CECI EST PRIMORDIAL – AUX DROITS DE PROPRIETE. - Contrôler les propriétés publiques et privées durant une situation d’urgence concernant la santé publique, y compris les usines de fabrication de produits pharmaceutiques, les maisons de retraite, les autres établissements de soins de santé, et les dispositifs de communication. - MOBILISER L’ENSEMBLE OU UNE PARTIE DE LA “MILICE ORGANISEE AU SERVICE A L’ETAT AFIN D’AIDER A FAIRE RESPECTER LES ORDRES DE L’ETAT”. Le rationnement des armes à feu, des explosifs, de la nourriture, du carburant et des boissons alcoolisées, parmi d’autres produits de base. - IMPOSER DES AMENDES ET DES SANCTIONS AFIN DE FAIRE RESPECTER LEURS ORDRES. Alors voilà. Vous serez à présent officiellement déclaré comme étant un criminel si vous refusez le vaccin et la force mortelle peut être utilisée contre vous si vous résistez. Et de penser que non seulement notre gouvernement fédéral accepte cette abomination, mais qu’il a également réussi à faire adopter les mêmes lois dans la plupart des états… Je vais revoir cette liste de pouvoirs dans un article ultérieur puisque tout ceci a trait à la “réforme des soins de santé” qui nous arrive, et à d’autres lois odieuses qui sont en cours d’élaboration. Cela me donne une pause pour penser à ceci : se pourrait-il que cette soi-disant réforme des soins de santé dont le gouvernement déclare qu’elle doit être faite tout de suite, maintenant, rapidement, immédiatement, sans perdre de temps, soit liée d’une façon ou d’une à cette déclaration de l’OMS? Hmmmm. Il y a quelque chose de très louche ! Ces maudits exercices de la FEMA … feraient-ils partie d’un plan? Je me méfie de cet exercice de la FEMA, qui se déroule non seulement pour des raisons évidentes… mais aussi pour sa proximité par rapport aux vaccinations forcées que l’on a prévue de rendre obligatoires au début de l’automne. NOTRE PROPRE GOUVERNEMENT A EXPRIME SON INTENTION DE VACCINER DE FORCE LES ENFANTS DES ECOLES EN TANT QUE COMMENCEMENT. PAR TOUS LES MOYENS… CIBLEZ LES PLUS VULNERABLES EN PREMIER LIEU. (Prenez ceci de la façon que vous voulez). Sur MSM, hier soir il a été signalé que les jeunes âgés de 19 à 24 ans sont, pour une raison quelconque, les plus sensibles à ce virus créé en laboratoire. Je trouve cela curieux, puisque ce segment de la population est généralement le plus sain. Depuis que la grippe “porcine” a été exposée de façon si approfondie comme ayant été créée en laboratoire, à présent ils ne l’appellent plus simplement la grippe « machin N1 ». Apparemment, ce premier essai de ce qui était censé être une pandémie mondiale pourrait ne pas décoller: il ne s’est pas propagé comme il était espéré. Bien sûr, la même chose se produisit avec le SRAS et la grippe aviaire… Ces maladies-là n’ont pas fonctionné, donc à présent, nous avons la « grippe porcine », ou la grippe « machin N1 ». Etrange, la façon dont toutes ces grippes ont apparu après qu’ils aient exhumé des corps à partir de fosses communes pour voir si ces gens étaient vraiment morts de l’épidémie de grippe en 1918. La nouvelle version améliorée de ce virus est maintenant ce que nous appelons la « machin N1 ». Pour commencer, une souche de la grippe, créée artificiellement, va être lâchée dans des zones sélectionnées. Etant donné que je crois que des milliers de personnes vont tomber malades simultanément, cela constituera le facteur de peur nécessaire pour amener des milliers d’autres personnes à ce qu’elles pensent être un vaccin qui va les sauver. Ceux qui veulent se mettre en quarantaine d’eux-mêmes, ou qui refusent tout simplement les vaccins, seront soit incarcérés dans les camps de la FEMA, ou éliminés d’une autre façon. Les vaccins, qui n’ont pas été testés pour leur sécurité ou leur efficacité, peuvent causer et causeront des dommages à un grand nombre de ceux qui reçoivent l’injection, mais les poursuites judiciaires pour les dommages causés seront interdites. Ce forcera, par peur, des milliers d’autres personnes à recevoir les vaccinations (qui sont chargées de toxines et d’agents pathogènes), cherchant se sauver eux-mêmes de l’incarcération forcée, ou pire. À un certain point, nous allons découvrir que les TROUPES ETRANGERES, qui auraient seulement participé à un simulacre d’exercice, sont non seulement encore ici sur notre sol, mais que leur nombre s’est multiplié. La loi martiale sera déclarée en utilisant l’autorité unilatérale accordée au président dans le cadre du John Warner Defense Authorization Act de 2007 (loi John Warner sur l’autorisation de la défense), qui permet au président de déclarer une situation d’urgence « même s’il est la seule personne à en percevoir une ». Les troupes étrangères n’ont pas l’inhibition naturelle que notre propre armée possède pour tirer sur des citoyens américains… c’est la raison pour laquelle elles sont ici. Je ne crois pas que c’était un simulacre d’exercice. Je pense qu’il s’agit, en fait, du placement stratégique et planifié de troupes étrangères au sein des États-Unis pour un événement prévu et planifié. Les wagons bien ventilés à trois étages, qui sont présentés comme n’étant rien de plus que des transporteurs pour de grands véhicules de type SUV, seraient vraiment très utiles, à ce stade-ci. Des troupes étrangères et du matériel militaire pourraient être déplacés plus loin à l’intérieur du pays et mis en place sans que personne ne sache jamais qu’ils sont là jusqu’à ce qu’ils soient nécessaires. D’ailleurs, je ne connais pas de transporteurs de voiture qui ont besoin d’autant de ventilation bien ciblée : des humains, par contre, pourraient en avoir besoin. Je pense qu’il y aura plusieurs événements catastrophiques à partir de la mi-août jusqu’à la fin du mois d’octobre, et peut-être un peu en novembre. À la fin de cette période, après que le public américain ait été effrayé à mort, tout commencera à se combiner, et cela culminera à la fin de l’année. Dans l’intervalle: verrons-nous la mort de milliers et de milliers d’Américains et d’autres peuples dans le monde, sinon des millions ? J’étais curieux de savoir pourquoi l’OMS élèverait cette grippe vers une catégorie pandémique (phase 4) alors qu’il n’y avait pas de preuve qu’elle était pandémique. « Cette pandémie s’est caractérisée, jusqu’à ce jour, par la douceur des symptômes chez une grande majorité des patients, qui récupèrent d’habitude, même en l’absence de traitement médical, en l’espace d’une semaine après l’apparition des symptômes ». Puis vinrent les prédictions de notre gouvernement que la « grippe » seraient probablement bien pire à l’automne. Selon moi, cela indique qu’une nouvelle souche plus virulente a été élaborée et est prête à être répandue. Je base ceci sur les preuves selon lesquelles la grippe a été créée en laboratoire et ne se serait pas produite naturellement, en combinant quatre souches d’ADN non apparentées… les déclarations faites par le CDC et selon lesquelles qui ils avaient un vaccin dans une période de trois semaines après la “flambée”… en sachant que le stock de germes pour les vaccins met au moins 12 semaines à élaborer, et plusieurs semaines supplémentaires pour être produit en masse… et les ordres, donnés au cours de la dernière année de l’Administration Bush criminelle, concernant le Tamiflu, qui est censé être le remède ou la prévention à une grippe qui n’existait pas à ce moment-là, du moins pas publiquement. Ce qui a été mis en œuvre depuis plusieurs années, si pas depuis des décennies, est sur le point de se concrétiser. Accrochez-vous à vos fesses ! Cela va être une course en voiture sur un chemin plein de bosses ! The French are set to return from their holidays at the beginning of September to find France under martial law, public buildings and transport closed, travel restricted at airports as well as the border, and the country divided into “defence zones” while the army prepares to administer forced vaccinations under WHO regulations incproration into then French national pandemic plan. The French government has announced the country will shift to its internel pandemic level 6 from September, switching the country from civil to military rule. Under the French national pandemic plan, the WHO will “cooperate” with French health bodies to enact measures such as mass vaccinations and quaratines as the country. A special “crisis committee” will be set up in the Ministry of Interior and will conduct “pandemic” operations independently of elected political bodies following WHO and EU instructions. The French health minister is set to be the principal “interlocutor” with the WHO in implementing WHO’s International Health Regulations 2005. Reservists will be called up to help enforce vaccinations and quarantines. Anne Laude of the department of medical law at the University Paris-V-Descartes has said no one will have the right to refuse the vaccination unless they have a medical condition. ,Wer das Hôpital Foch in Suresnes nahe Paris (Hauts-de-Seine) betritt, dem stechen als erstes die großen orangefarbenen Plakate ins Auge, mit denen das Gesundheitsministerium der Bevölkerung Verhaltensmaßnahmen einimpfen will, die der neuen Grippe A/H1N1 vorbeugen sollen. Wer der Krankheit entkommen will, soll sich regelmäßig die Hände waschen, zum Niesen ein Taschentuch benutzen und den Arzt anrufen, wenn er erste Anzeichen einer Infektion bemerkt. In dem Krankenhaus hatten sich Ende Juli zwei Mitarbeiter des medizinischen Personals mit dem H1N1-Virus infiziert. Zwanzig Patienten, bei denen das Risiko einer Infektion bestand, wurden in Quarantäne gesteckt’und mit dem antiviralen Medikament Tamiflu behandelt. Zudem wurde ein Krisenstab eingerichtet, der das leitende Personal jeden Tag um 15 Uhr zu einer Lagebesprechung zusammenrief. Alle Mitarbeiter der betroffenen Lungenheilkundeabteilung mussten Masken tragen. Wer Grippesymptome zeigte, wurde sofort untersucht und zu Hause isoliert. Nach 11 Tagen wurden die Sicherheitsmaßnahmen wieder aufgehoben. Schon seit Januar war das Personal mit Notfallübungen auf solch ein Ereignis vorbereitet worden. Viele Ärzte zeigten sich aber verunsichert über die Art und Weise, wie die Regierung die Kontrolle über die Maßnahmen übernahm. Bisher war unbekannt, in welchem Ausmaß die Bekämpfung der H1N1-Grippe in Frankreich von der Armee koordiniert wird. “Letztlich folgen wir den Anweisungen des Militärs”, berichtet eine Mitarbeiterin des Krankenhauses gegenüber Telepolis. Man bekomme den Eindruck, mitten im Krieg zu sein. Ganz falsch ist das nicht: Denn der nationale Präventions- und Kampfplan gegen die Grippepandemie (Plan national de prévention et de lutte “Pandémie grippale”) wurde vom französischen Militär ausgearbeitet. Verantwortlich zeichnet das Secrétariat général de la défense nationale (SGDN), eine beim Premierminister angesiedelte Einrichtung, die lange Zeit die Arbeit der Geheimdienste koordinierte. Dieses Sekretariat befasst sich mit der Ausarbeitung von Krisenplänen der Regierung und berät sie in Verteidigungsangelegenheiten. So erstellte das SGDN zum Beispiel den nationalen Antiterrorismusplan Vigipirate. Außerdem ist es in die Abwehr von Wirtschaftspionage und Cyberwar-Angriffen sowie die Kontrolle des Waffenhandels eingebunden. Ab Oktober 2004 arbeite das SGDN auch am ersten Plan zur Bekämpfung des Vogelgrippe-Virus H5N1. Dieser Plan wurde immer weiter ausgebaut – und wird nun auf das Schweinegrippevirus H1N1 angewandt. Dabei wird völlig unterschlagen, dass die H1N1-Grippe ganz anders beschaffen ist, als die Vogelgrippe: Während die nun virulente Schweinegrippe sehr ansteckend zu sein scheint, aber nur in den seltensten Fällen zum Tode führt, ist die Vogelgrippe kaum ansteckend, verläuft aber in 60 Prozent der Fälle tödlich. Die in dem Plan aufgeführten Maßnahmen scheinen dem aktuellen Risiko also völlig unangemessen zu sein. Im nationalen Präventions- und Kampfplan gegen die Grippepandemie ist festgelegt, welche Maßnahmen in jeder der sechs Epidemie-Phasen durchgeführt werden müssen. Die Regierung hatte angekündigt, dass Frankreich zur “rentrée” im September – wenn die Urlauber aus den Sommerferien zurückkehren – von dem derzeitigen Niveau 5A (Übertragung des Virus von Mensch zu Mensch im Ausland) auf die maximale Alarmstufe 6 springen könnte (Übertragung des Virus von Mensch zu Mensch in Frankreich), was unter anderem die Schließung öffentlicher Einrichtungen und Verkehrsmittel, Einschränkungen im Flugverkehr und medizinische Kontrollen an den Grenzen bedeuten würde. Außerdem wird das Land in Verteidigungszonen eingeteilt und jedem Präfekten ein Armeeoffizier zur Seite gestellt. Das Militär soll dann auch direkt zum Einsatz kommen. So sollen unter anderem Reservisten einberufen werden, um den Einsatz der Armee im Inneren zu gewährleisten. Das Militär soll den Zugang zu Krisenzentren und Verteidigungseinrichtungen einschränken und Gesundheitskontrollen durchführen. Außerdem sollen Soldaten bei der Verteilung von Hilfsgütern eingesetzt werden. Im Zusammenhang mit einer anderen möglichen Maßnahme weckt die tragende Rolle des Militärs Unbehagen: Ende Mai berichtete das Journal du Dimanche, die Regierung erwäge die Zwangsimpfung der gesamten französischen Bevölkerung, sollte sich das Virus im Herbst massiv verbreiten. “Niemand hätte das Recht, sich einer Impfung zu verweigern – außer im Falle einer medizinischen Indikation” sagt Anne Laude vom Institut droit et santé der Universität Paris-V-Descartes. Zwangsverabreichungen von Impfdosen sind vor allem deshalb fragwürdig, weil sie tief in die Persönlichkeitsrechte eingreifen. Zudem sind die Nebenwirkungen der Impfungen oft nicht abschätzbar, eine “medizinische Indikation” ist also bei niemandem auszuschließen. Damit sind solche Impfungen de facto Menschenexperimente in großem Stil. Überdies nützen die bereits von der Regierung bestellten Impfstoffe überhaupt nichts, wenn das Virus sich durch Mutationen verändern sollte. Hinzu kommen die hohen Impfkosten von bis zu einer Milliarde Euro. Zwar ist bisher nicht entschieden, ob die Regierung diesen drastischen Schritt gehen wird und wie diese Zwangsimpfungen umgesetzt werden sollen. Dennoch stellt sich die Frage, welche Rolle dem Militär bei solchen Zwangsmaßnahmen zukommen könnte. Unter Umständen könnte sich das umgekehrte Szenario abspielen wie in dem Film Outbreak (1995) von Wolfgang Petersen, wo das Militär gewaltsam versucht, die Verabreichung eines Antiserums gegen einen Biokampfstoff zu verhindern. In jedem Fall sind diese Vorschläge ein gutes Beispiel für die These der Globalisierungskritikerin Naomi Klein, die von einem Schock-Zustand spricht, in den moderne Gesellschaften – hier etwa durch die Grippeangst – versetzt werden, um dann drastische Maßnahmen durchzuziehen, die unter normalen Umständen nie akzeptiert worden wären. So könnte die Ausrufung einer Pandemie dazu führen, dass die Bevölkerung Einschränkungen der Freiheit und Eingriffe in Persönlichkeitsrechte klagloser akzeptiert. Denkbar wäre auch, dass die klare Trennung zwischen zivil angeforderter Amtshilfe und der Übernahme hoheitlicher Funktionen durch das Militär im Pandemiefall nicht mehr aufrecht erhalten wird. Die Grenzen zwischen innerer und äußerer Sicherheit verschwimmen schon heute: Die Einwohner der französischen Hauptstadt sind es bereits gewohnt, im Alltag patrouillierenden Militärs zu begegnen. So laufen einem an strategischen Punkten der Pariser Metro zu jeder Tageszeit ganze Gruppen nervöser Soldaten über den Weg, den Finger am Abzug ihrer FA-MAS-Sturmgewehre. Dabei ist klar, dass diese Militärpräsenz kein Attentat verhindern wird. Diese Simulation von Sicherheit bewirkt eher das Gegenteil: Die Fahrgäste fühlen sich ständig daran erinnert, Zielscheiben zu sein. Ähnlich funktioniert die präventive Militarisierung im Fall der Grippebekämpfung. “Heute stehen wir schon im Bann der Seuche, bevor sie bei uns angekommen ist”, gibt die Historikerin Silvia Berger zu Bedenken. Vor allem durch ihre Bekämpfung wird ein politisch ausbeutbarer Bedrohungszustand erzeugt. Die französische Regierung habe mit ihren Maßnahmen vor allem für Angst in der Bevölkerung gesorgt, kritisierte auch Professor Bernard Debré vom Nationalen Ethik-Komitee. Die durch den H1N1-Virus ausgelöste Krankheit bezeichnete er als ein “Grippchen”, das weniger gefährlich sei als die normale Saisongrippe. The Pentagon has approached Congress to grant the Secretary of Defense the authority to post almost 400,000 military personnel throughout the United States in times of emergency or a major disaster. This request has already occasioned a dispute with the nation’s governors. And it raises the prospect of U.S. military personnel patrolling the streets of the United States, in conflict with the Posse Comitatus Act of 1878. Paul Stockton, Assistant Secretary of Defense for Homeland Defense and America’s Security Affairs, in a letter to the National Governors Association, dated July 20. The governors were not happy about this proposal, since they want to maintain control of their own National Guard forces, as well as military personnel acting in a domestic capacity in their states. According to Pentagon public affairs officer Lt. Col. Almarah K. Belk, Stockton has not responded formally to the governors but understands their concerns. Belk said the legislative change is necessary in the aftermath of a “catastrophic natural disaster, not beyond that,” and she referred to Katrina, among other events. That section gives the President the sole discretion to designate an event as an “emergency” or a “major disaster.” Both are “in the determination of the President” alone. At the moment, says Pentagon spokesperson Belk, the legislation does not have a sponsor in the House or the Senate. For more information on NorthCom, see Matthew Rothschild’s “What Is NorthCom Up To?” which ran on the cover of The Progressive’s February issue. The World Health Organization determined in 2005 it has the authority to dissolve sovereign governments and take control should there be a pandemic. This applies to any country signed onto WHO which of course we are. The WHO just raised this non-existent pandemic to level 4. From the WHO 2005 declaration: (excerpted) Under special pandemic plans enacted around the world including the USA, in 2005, national governments are to be dissolved in the event of a pandemic emergency and replaced by special crisis committees, which take charge of the health and security infrastructure of a country, and which are answerable to the WHO and EU in Europe and to the WHO and UN in North America. Force individuals suspected of harboring an infectious disease to undergo medical examinations. Preempt existing state laws, rules and regulations, including those relating to privacy, medical licensure, and “this is key“ property rights. Mobilize all or any part of the organized militia into service to the state to help enforce the state’s orders. Impose fines and penalties to enforce their orders. So there you have it. You are now officially to be declared a criminal if you refuse the vaccine and deadly force can be used against you if you resist. And to think, not only did our federal government agree to this abomination, it was also successful in getting the same laws passed in most states. I will be revisiting this list of powers in a subsequent article as it relates to the coming healthcare reform, and other odious pieces of legislation being devised. This gives me pause to consider this: Could the so-called healthcare reform that the government claims must be done right away, right now, quickly, immediately no time to waste be tied somehow to this WHO declaration? Hmmmm. I smell a really big rat! Those pesky FEMA drills part of a plan? On MSM last evening it was reported that young people between the ages of 19 and 24 are for some reason most susceptible to this lab created virus. I find this curious as this segment of the population is generally the healthiest. Since the swine flu has been so thoroughly exposed as lab created they are now just simply calling it the N1 whatever flu. Apparently this first test run of what was supposed to be a global pandemic couldn’t get off the ground: it didn’t spread as was hoped. Of course the same thing happened with SARS and the Bird Flu..Those didn’t work so now we get the Swine Flu, or the N1 Whatever Flu. Strange how all these flu’s showed up after they dug up bodies from mass graves to see if they really did die from the flu epidemic in 1918. The new and improved version of this virus is now what we are calling N1 Whatever Flu. A created strain of flu is going to be set loose in selected areas to begin with. As I believe thousands are going to fall ill simultaneously it will be the fear factor needed to bring thousands more in for what they believe is a vaccine that will save them. Those that want to self-quarantine, or who simply refuse the vaccines, will either be incarcerated in FEMA camps or otherwise disposed. The vaccines which have not been tested for safety or effectiveness can and will cause harm to many of those receiving the shots, but will be off limits to lawsuits for harm caused. This will force thousands more in for the vaccinations, out of fear, which are loaded with toxins and pathogens seeking to save themselves from forced incarceration or worse. At some point in this, we will find out that the foreign troops who supposedly only participated in a mock drill, are not only still here on our soil, but their numbers have multiplied. Martial law will be declared using the unilateral authority granted the president under the John Warner Defense Authorization Act of 2007, which allows the president to declare an emergency even if he is the only person to perceive one. Foreign troops lack the natural inhibition our own military has about firing on US citizens that’s why they are here. I do not believe this is a mock drill. I think it is actually the planned strategic placement of foreign troops within the US for an anticipated and planned event. The vented three story rail cars which are claimed to be nothing more than haulers for large SUV type vehicles would come in really handy here. Foreign troops and military equipment could be moved further into the country and put in place without anyone ever knowing they were there until they were needed. Besides, I don’t know of any car haulers that need that much targeted ventilation: humans on the other just might. I feel that there will be several catastrophic events from about mid-August to the end of October and maybe into November somewhat. At the end of this period, after the American public has been frightened to death, everything will begin coalescing and will culminate at the end of the year. In the interim: will we see the deaths of thousands upon thousands of American’s and other peoples around the world, if not millions? I was curious as to why the WHO would move this flu into a pandemic (phase 4) category when there was no evidence that it was pandemic. This pandemic has been characterized, to date, by the mildness of symptoms in the overwhelming majority of patients, who usually recover, even without medical treatment, within a week of the onset of symptoms. Then came the predictions from our government that the flu would probably become much worse this fall. This indicates to me that a new and more virulent strain has been developed and is set to be turned loose. I base this on the evidence that the flu was lab created and would not have occurred naturallycombining four unrelated dna strains the statements by the CDC that they had a vaccine within three weeks of the outbreak..knowing that seed stock for vaccines takes at least 12 weeks to develop and several more weeks to mass produce and the orders during the last year of the Bush Crime Administration for Tamiflu which supposedly is the cure or prevention for a flu which didn’t exist at the time, at least not publicly. Whatever has been in the works for several years, if not for decades is about to come to fruition. Grab your hats! This is going to be one bumpy ride! I'm just a American patriot who believes in freedom for all, even the ones I don't like. It's time to make a stand and take over the media, government, and police of this nation. Join me in the movement and join the forums. * SWINE FLU SHOCK – IS IT A BIOLOGICAL WEAPON? This entry was posted on Saturday, August 15th, 2009 and is filed under Big Pharma, Body,Health & Mind, Vaccine. You can follow any responses to this entry through the RSS 2.0 feed. You can leave a response, or trackback from your own site. This is it ladies and gentlemen... "New Aeon" the "New Dawn" the "New Age" the NEW WORLD ORDER that the apron wearing Freemasons, and power elite have been having premature orgasms over for the past 100 years. A New Dawn has come to Amerika, a New Dawn has come to entire world.. a Red Dawn! Either you start Preparing for your VERY Existence and that of your family.. Either you start Preparing to fightlike the Patriots of Old across the globe for your right to exist FREE..
the choose is your in the end. dusplashThe World Health Organization determined in 2005 it has the authority to dissolve sovereign governments and take control should there be a “pandemic”. This applies to any country signed onto WHO….which of course we are. The WHO just raised this non-existent pandemic to level 4. From the WHO 2005 declaration: (excerpted) “ Under special pandemic plans enacted around the world including the USA, in 2005, national governments are to be dissolved in the event of a pandemic emergency and replaced by special crisis committees, which take charge of the health and security infrastructure of a country, and which are answerable to the WHO and EU in Europe and to the WHO and UN in North America. Preempt existing state laws, rules and regulations, including those relating to privacy, medical licensure, and–this is key–property rights. Mobilize all or any part of the “organized militia into service to the state to help enforce the state’s orders.” Ration firearms, explosives, food, fuel and alcoholic beverages, among other commodities. So there you have it. You are now officially to be declared a criminal if you refuse the vaccine and deadly force can be used against you if you resist. And to think, not only did our federal government agree to this abomination, it was also successful in getting the same laws passed in most states. I will be revisiting this list of powers in a subsequent article as it relates to the coming “healthcare reform”, and other odious pieces of legislation being devised. This gives me pause to consider this: Could the so-called healthcare reform that the government claims must be done right away, right now, quickly, immediately….no time to waste be tied somehow to this WHO declaration? Hmmmm. I smell a really big rat! Those pesky FEMA drills…part of a plan? On MSM last evening it was reported that young people between the ages of 19 and 24 are for some reason most susceptible to this lab created virus. I find this curious as this segment of the population is generally the healthiest. Since the “swine” flu has been so thoroughly exposed as lab created they are now just simply calling it the N1 whatever flu. Apparently this first test run of what was supposed to be a global pandemic couldn’t get off the ground: it didn’t spread as was hoped. Of course the same thing happened with SARS and the Bird Flu…..Those didn’t work so now we get the “Swine Flu”, or the N1 Whatever Flu”. Strange how all these flu’s showed up after they dug up bodies from mass graves to see if they really did die from the flu epidemic in 1918. The new and improved version of this virus is now what we are calling N1 Whatever Flu. Martial law will be declared using the unilateral authority granted the president under the John Warner Defense Authorization Act of 2007, which allows the president to declare an emergency “even if he is the only person to perceive one”. Foreign troops lack the natural inhibition our own military has about firing on US citizens…that’s why they are here. I do not believe this is a mock drill. I think it is actually the planned strategic placement of foreign troops within the US for an anticipated and planned event. Then came the predictions from our government that the “flu” would probably become much worse this fall. This indicates to me that a new and more virulent strain has been developed and is set to be turned loose. I base this on the evidence that the flu was lab created and would not have occurred naturally combining four unrelated dna strains……the statements by the CDC that they had a vaccine within three weeks of the “outbreak”…..knowing that seed stock for vaccines takes at least 12 weeks to develop and several more weeks to mass produce……and the orders during the last year of the Bush Crime Administration for Tamiflu which supposedly is the cure or prevention for a flu which didn’t exist at the time, at least not publicly. Whatever has been in the works for several years, if not for decades is about to come to fruition. Grab your butts! This is going to be one bumpy ride!